If you want a truly personalized presence on Snapchat, you can’t beat Snapchat stickers. 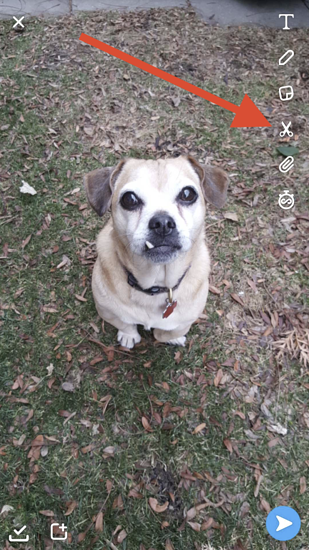 While Snapchat users everywhere know and love both lenses and filters, it’s hard to find a tool that provides the same customization (and fun!) of stickers. Snapchat stickers are images used to customize Snapchat pictures shared on Snapchat, known as “snaps.” Snapchat provides stickers they have created, such as time-stamp and temperature stickers. 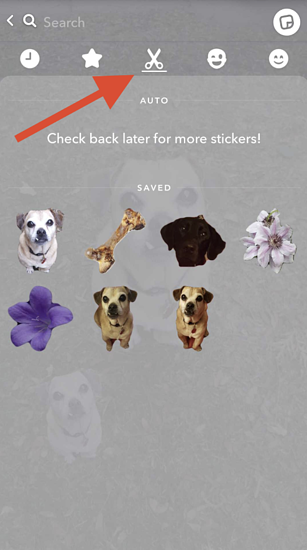 Users can create custom stickers that can be re-used on multiple snaps. 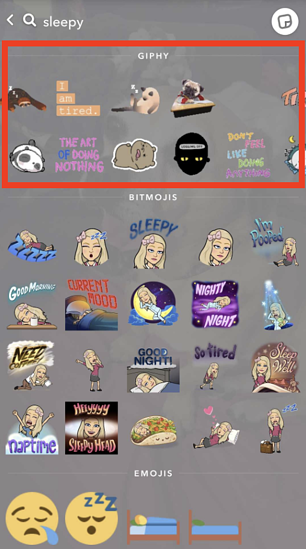 GIFs (provided by GIPHY), emojis, and personalized Bitmoji icons are additional types of Snapchat stickers. Whether you’re looking to add some personality to your snaps or can’t come up with that perfect quote, stickers are the perfect way to make your Snapchat stories shine. As a kid, I loved stickers. The possibilities provided by sticker books felt endless: I could add hearts, puppies, and kittens to anything I owned! Now that I’m adult, my love of stickers has not faded. Just like any picture, a sticker says more, and can hold more emotional impact, than words alone. And, while I still love to use stickers on my laptop and thank-you cards, the opportunities for sticker placement have been quite limited in an adult world. Now, social media stickers, especially on Snapchat, can give all of us the fun you felt when you were a kid. Not only that, since the stickers are digital, the personalization options are truly endless. 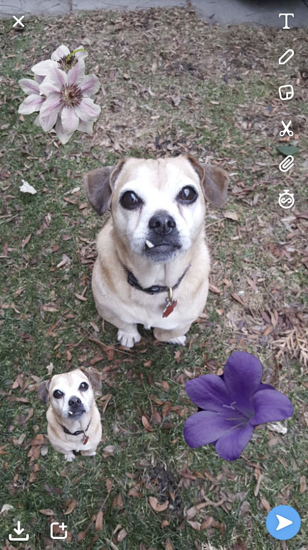 Ready to add some custom flair to your snaps? Let’s start with how to add stickers on Snapchat. Then we’ll look at the types of stickers waiting at your fingertips, and you’ll learn how to make your very own Snapchat stickers. Begin by opening your Snapchat app and logging in if needed. Use the white circular button at the bottom of your screen to capture your picture, also known as your snap. When you want to switch to or from selfie mode, tap the icon with two arrows in the upper right corner. Once you’ve captured your snap, the toolbar will appear on your screen’s right side. Tap the sticker icon, which looks similar to a Post-It note with the corner folded over. Once you’ve tapped the sticker icon, you’ll discover a plethora of sticker icons to choose from. Browse through the stickers, find one you like, then tap on it. After tapping on a sticker, it will immediately appear on your snap. To resize your sticker: Use your finger and thumb in a pinching motion to make your sticker smaller, or do the opposition motion to make your sticker bigger. 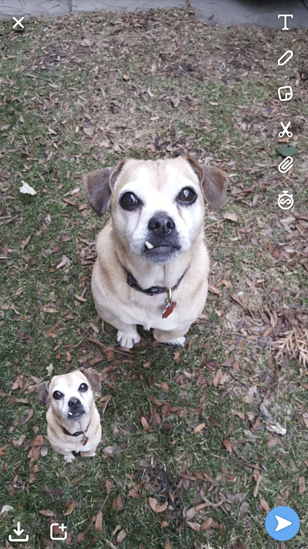 Why have one Snapchat sticker when you can have two, three, or even ten? Repeat steps 2-4 and add as many stickers as you’d like to your image. Once you’ve got all your stickers in place and ready to go, send your snap by tapping the blue icon in the bottom-right corner of your screen. Tip: Before sending your stickered snap, feel free to add any text or drawings using the icons in your toolbar. You can also add a Snapchat filter by swiping across your screen. Now that you know how to add a sticker, let’s explore the many options available to you on Snapchat! In this section, we’ll look at six types of Snapchat stickers. Once you’ve opened the sticker tool, you’ll find the icon for each type of sticker on the top of your screen. We’ll go through each of them in order now. Recent Snapchat stickers are just what they sound like - these are the images you have used most recently. If your recent stickers section isn’t full, Snapchat will automatically fill it with popular emojis. 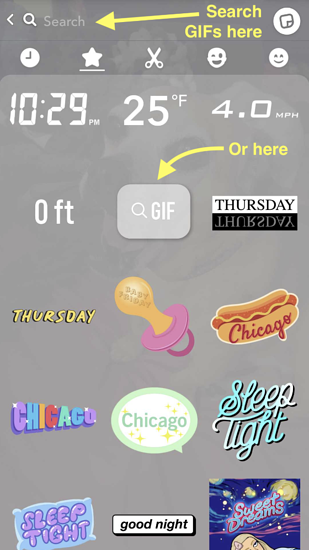 The Snapchat recommended stickers automatically appear when you open the sticker tool. These include the time stamp as well as stickers for the day of the week or time of day. In the screenshot below, you can see the multiple stickers for Wednesday, as well as “Good night” and “sleep tight” stickers since it’s after 9:00 p.m. Custom Snapchat stickers are the stickers you create yourself. In the next section I’ll walk you through how to make a sticker. While we’re looking at the types of stickers, keep in mind this is where you can find all of your creations. Bitmojis are my favorite types of stickers. They are perfect for the times when I’m not feeling that clever; Bitmoji has done all of the creative thinking for me! Each of these icons is related to an emotion you want to share through your Bitmoji. For example, in the screenshot above, the “wave” icon is highlighted. And – big surprise! – plenty of my suggested Bitmojis are sharing a friendly wave. 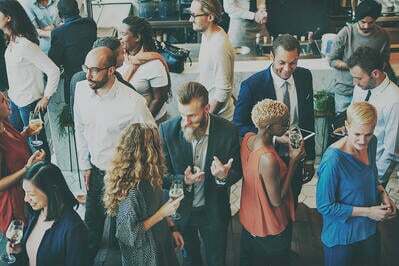 In today’s world of social media, emojis have become a standard part of communication. Snapchat emojis are no exception. 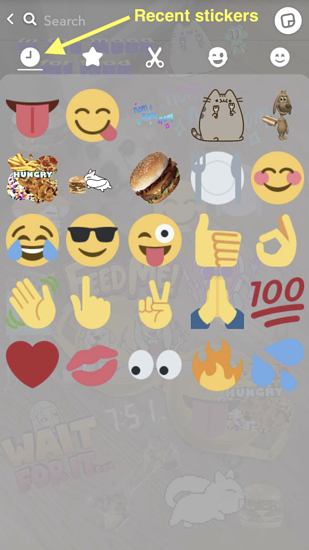 The last sticker tab has the standard emojis you’ll find when you text or use other social media platforms. While there is no icon for GIFs, you can still share animated stickers on Snapchat. 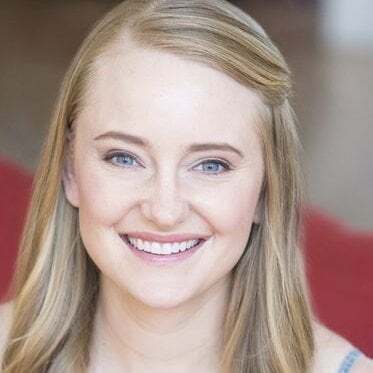 This feature was launched in February 2018, when Snapchat added GIF stickers provided by GIPHY giving its users the same animated experience available on Instagram. Since there is no GIF icon, the easiest way to find animated GIFs is by searching for them. To do so, simply enter a word in the search bar, or click the “GIF” button on the suggested Snapchat screen. As you can see, in addition to GIFs, a sticker search will also provide related Bitmojis and emojis. 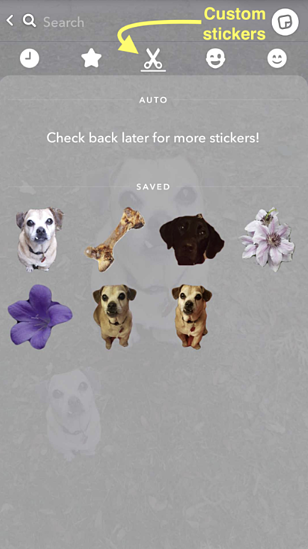 In this article we touched on custom Snapchat stickers. Now it’s time to learn how to make them yourself! Why depend on others to create stickers that suit your style when you can make them yourself? Now it’s time to see what those instructions look like. Just like adding a sticker created by Snapchat, you’ll begin by taking a snap. 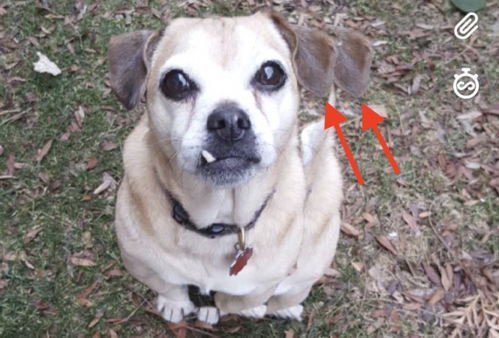 Begin by taking a snap by clicking the white circular button in the bottom center of your screen, as shown in the “How to add a sticker” section above. Within the Snapchat toolbar, click on the scissor icon. Trace around the desired area to create your sticker. Pro tip: While you can use your finger, if you happen to have a stylus, you’ll save yourself some time and a potential headache. The fine point of a stylus creates stickers with significantly more accuracy than your finger. Once you release your finger, your sticker will appear over the area you’ve just traced. 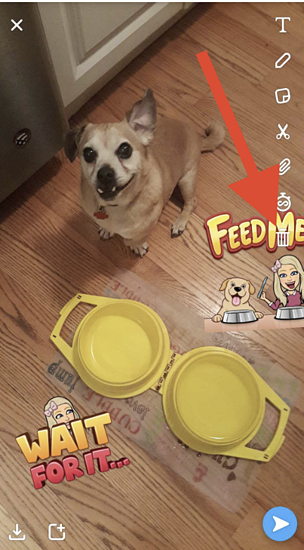 Click and drag on the sticker you’ve just created to move it within your snap. 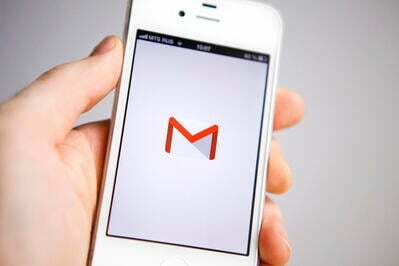 Just like standard stickers, resize your custom sticker by pinching it with your thumb and forefinger. In the above image, I’ve illustrated resizing and shifting the custom sticker I just created. Within your Snapchat toolbar, click on the sticker icon. As shown above, it looks like a Post-It note with the corner folded over. Within your Snapchat stickers, click on the scissors icon. Now you can add any other custom stickers you have created. As soon as you use the scissor icon to trace an image, the custom image will appear here. Click the blue button with the white arrow in the bottom-right corner of the screen to send your snap. 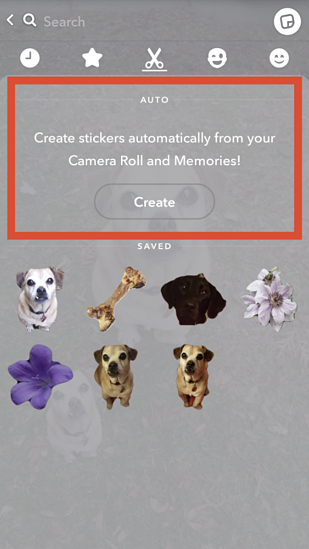 Instead of tracing people and objects to create stickers, you can also use Snapchat’s auto stickers tool. 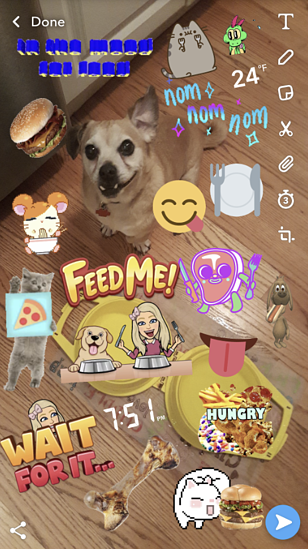 Using this feature, Snapchat will auto-generate suggested custom stickers. To use auto stickers, click on the sticker icon in your toolbar, then tap the scissors for custom stickers. Now, simply tap the “Create” button and see what Snapchat has in store! 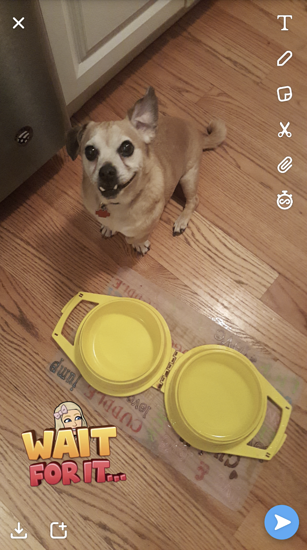 The auto sticker feature works best if Snapchat is synced with your camera roll and you have selfie-style pictures. Snapchat likes to make custom stickers of people’s faces; if you don’t have the right style photos in your Snapchat camera roll, Snapchat may not be able to make any auto stickers. Stickers on Snapchat are not scientific. With so many to explore, it’s common to use trial and error. This means you will often want to delete stickers before publishing to your Snapchat story. If you add a sticker, then change your mind and want to delete it, drag your sticker to the right side of your screen. To delete your sticker, hold it over the trash can, and it will magically disappear. Okay, so you don’t have to take a sticker test. And I’ll admit; maybe, just maybe, it’s possible to go too far. Now that you not only know how to use every kind of Snapchat sticker, but also create your own, you can consider yourself a sticker pro. Congratulations, you’ve officially made your 8 year-old self proud.